To ensure our Dome covers are completely waterproof, all seams in our fabric materials are heat welded and all cover components (i.e., main cover, end and front panels) are joined with storm flaps to provide additional moisture protection. 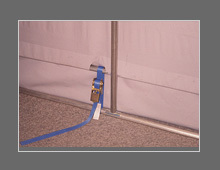 Also, all access door panels are equipped with heavy-duty nylon zippers that will not break in heavy winds or in extreme cold conditions to further ensure water tightness. 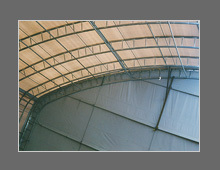 The cover of a Dome™ Shelter is secured and tightened to the base frame using ratchet straps and turnbuckles. The combination of steel inserts and ratchet straps are used to fasten the main cover to the base frame. The advantage of using steel inserts is to evenly distribute tension along the length of the shelter and eliminate wrinkles. Front end panels and are fastened to the end hoops using high strength no-stretch, woven cords. All cords are threaded through rustproof brass grommets, punched through automotive grade seat belt fabric (i.e., material stress bands with a strain capacity of 5000 lbs). This makes installing the cover easy and greatly enhances the life and appearance of the cover by ensuring it is tight and evenly stretched. 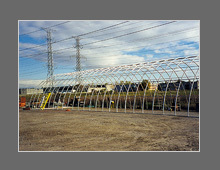 Our standard steel frame consists of structural steel arches and purlins to reinforce and brace the frame. For easy installation, factory welded metal inserts connect all steel tubing in the main frame and purlins are held in place with brackets and self-tapping screws.